Many great suggestions and tips can be found for students moving to the Netherlands for their bachelor or master studies. However, here are 3 things you should consider even if you are coming here on an exchange or for a visit. Firstly, accessibility to medicines might not be as you are accustomed to. If you suffer from a chronic condition or are in need of regular prescriptions, before coming here I recommend thoroughly researching the medicines’ availability and accessibility. Regarding the availability, note that the pharmaceuticals you are looking into might be available under a different name, so make sure that you look into all alternatives. If the medication is available on the Dutch market International Student Advisers can help with accessibility, by helping you choose the best doctor. Not having suffered from chronic conditions, medicines I’ve needed most often throughout my life have been available in any pharmacy without a prescription. This is definitely not the case in the Netherlands; in fact, I would say it is the opposite. Everything beyond Strepsils or Ibuprofen, you’ll probably need a doctor’s prescription to access. Additionally, doctors here seldom prescribe antibiotics. Therefore, if you are here for less than a year I recommend bringing your essential medicines with you, but be mindful of the quantity otherwise you might have a problem at customs. Secondly, take into consideration that general everyday costs in the Netherlands are higher than in neighboring countries. So expect supermarket goods being priced higher than in France or Germany. The most popular method of transportation within the Dutch cities is cycling, for traveling between cities there are great train connections, but they too come at a cost. A regular return train ticket to The Hague is 7,5 EUR, and the ride lasts 10-15 minutes as the distance from Leiden Centraal is 16 km (so explore subscriptions which can minimize the costs). If you keep this in mind and you organize your budget accordingly, you can definitely manage. The Netherlands actually has very diverse choices, and goods from all over the world are available. Cook at home for the most part, pre-drink before going out, and you can splurge on a restaurant meal or a fancy cocktail once in a while. Thirdly, payment methods can be surprisingly limited. When I first moved to the Netherlands I could not pay with any card that was not Maestro. The explanation behind this is that many establishments only accept debit, not credit cards, and in Dutch banks all debit cards are Maestro. Even though other countries have Visa Debit and Maestro credit cards, the former would not work on the Dutch machines and the latter would. This has been gradually improving, but it is still not perfect. Keep in mind that having a card from another EU country does not guarantee that it will work in the Netherlands, it varies from one bank to another. The law faculty cafeteria accepts debit, credit and cash payments, but some places (such as the university library cafe) do not accept cash payments. So if your card does not work and you are not here long enough to open a Dutch bank account, you might run into some inconveniences. There are also places where you can pay in cash only, and there isn’t really a pattern between the type of business and how you can pay. Most tourist attractions and establishments in the larger cities accept cash and all cards, but before you order, ask about your preferred payment method just in case. Knowing these three things before moving to the Netherlands, can truly eliminate a large portion of potential hurdles you might experience. So pack your bags and start your adventure stress-free! Regarding the needing of medicine when abroad (which by the way is an excellent thing to point out), the pharmacist at the International Health Centre’s International Pharmacy in The Hague told me that they accept prescriptions written by doctor’s registered abroad and can provide the medicine required to you as long as it is in stock. Oh thank you that is really good to know! Hopefully they equally accept prescriptions written by doctors registered outside the EU. The pharmacist told me that my Australian prescriptions would be accepted as long as the medicine was in stock. Not sure if Australia is an exception, but I found it amazing that this exists! 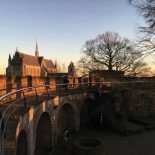 This entry was posted on April 9, 2019 by Devora in Devora, Leiden, Living in Holland, Practical Stuff, Student City, Student Life, Study, Travel and tagged Adventure, culture, Dutch, international student, leiden university, medicines, money, netherlands, study abroad, travel.